Torayca® T800 Carbon Applied, As Lightweight As 980 Grams. Full Carbon, Clincher Version Available. Redesigned Weight Distribution, Improving Dynamic Balance. Increased Outer Ring Weight, Better Inertia Performance. Inside the disc, it is not empty, we fill the inner space to increase the disc strength and stiffness. We tried use over hundred materials to test their strength and weight when they built with the carbon composite, finally we found PMI provides the best of stregth and weight. Purchased a disc recently and had my first race on it last weekend and absolutely loved it!!!. Felt fast into the headwind. Recorded my fastest ever bike split using the disc with the BladeX 88mm front wheel. Looks great! !, Feels light and rolls smooth. Cant beat the price on such an awesome Disc. Can the 10 speed disc be upgraded to 11 speed? 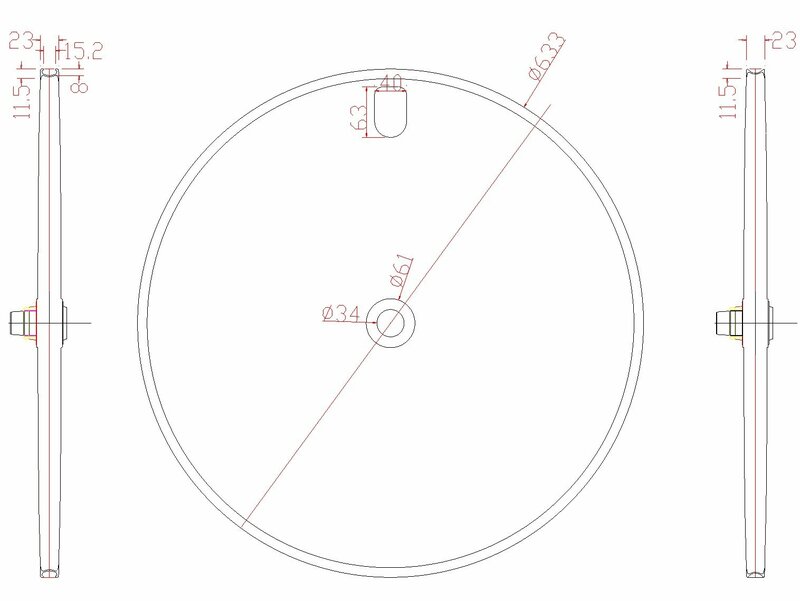 This Disc wheel is compatible with Shimano 9/10/11 speeds, with a spacer it’s 9/10 speed compatible, without a spacer, it becomes 11 speed compatible. Our Disc Wheel is compatible with Shimano 9/10/11 speed, you can use it in 10 speed now, and upgrade to 11 speed in the future. According to today’s currency, the price for a Tubular Disc is $1252 AUD, including Free Shipping to Australia. Let me know if you have anymore questions, thanks! I have purchased from you one pair of rims and i am really very happy with them. I wonder about your disc wheels (for triathlon). Can you tell me which is the best one you produce? also, i would like this wheel with no logos, is that possible? Thanks for your contacting me. The disc wheel is the one of our best products, it is the latest version,and through a variety of test. This disc wheel is 3k, now the 3k wheels is a hot sale products on our store. The UD wheel can also be available, I will send pictures of these disc wheel to you. We can make the wheel with no logo. If you have any further questions, please feel free to contact me.thanks! hi….is it clincher too or only tubular? ?what kind of paint /design finish you do?I want it quick ,wuthin 12 days max….is it possible? Tubular and Clincher are available, and need to make it 3K finish to guarantee the quality. We happen to have a wheel in stock(For Shimano 9/10/11 Speed). If you need it urgently, we can ship by FedEX(4-7 days delivery). You only have to pay $49 extra for the shipping cost. Thanks for your reply…..the wheel you have in stock is tubular…?? because I can use only tubular. Yes, the disc wheel is tubular. Because buyer usually use tubular for racing. OK. I will place an order from you. Thank you. Looking forward to your order. Have a nice day! As you know I have been using the clincher disc for a while now and I thought may be I should give a small feedback on whats good and what can be better. The wheel has a good weight spec, its heavy enough to carry good momentum and light enough to accelerate quickly and not be a hindrance on flyovers and small climbs. The Wheel is still in perfect circle and rolls straight even after many intense training sessions of acceleration and high speed bends. The wheel is no doubt strong as it is still in good shape even after around 3000kms of use on Indian roads. A 90 degree valve adapter, if provided with the product, will enhance its value as its not easy to fill air given the small valve pockets. The valve pocket reduces the weight from one end of the disc, I’m not sure if balance weight is added to other end but when rolling the wheel on stands I can feel the weight imbalance. So a solid valve cover with groove for the valve can help balance the wheel.